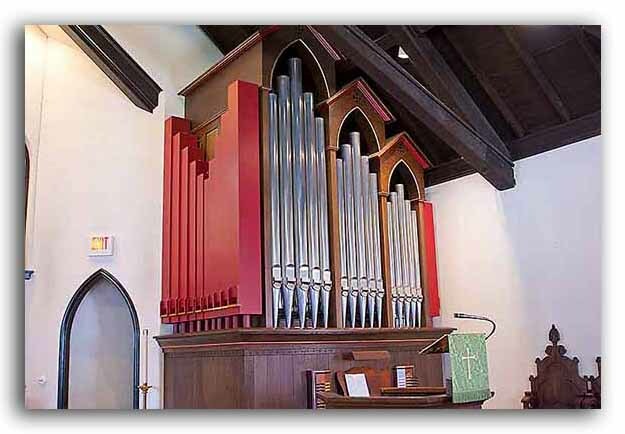 The Good Shepherd organ was built by the Dobson Organ Company, which is located in the small western Iowa town of Lake City. Lynn A. Dobson, owner and artistic director of the firm, designed the case of the organ. Free-standing, the organ contains approximately one thousand pipes arranged in 17 ranks and 15 stops. The pipes, some of wood and others of a lead/tin alloy or of zinc, are played by two manual keyboards and a pedal keyboard through an entirely mechanical system of levers and rods between the keyboards and pipe valves. This system, called tracker action, is extremely long-lived and has been used in organ construction since the instrument’s invention about 2,300 years ago.